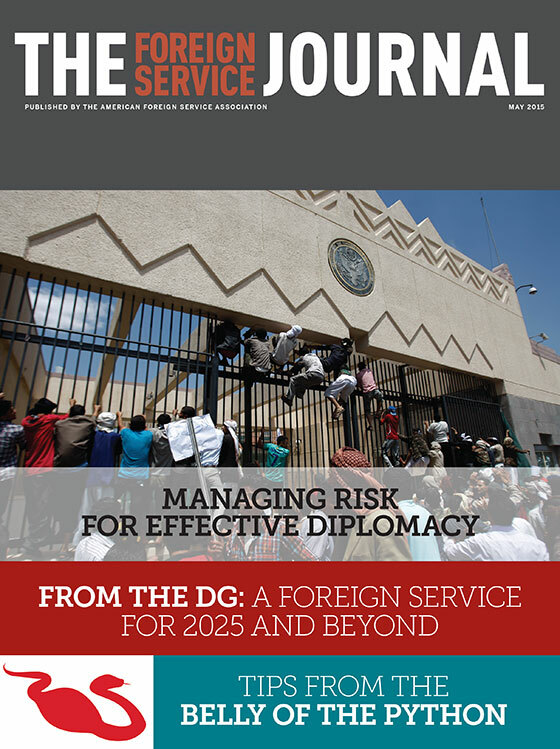 This month, we take a close look at an evergreen Foreign Service challenge that has assumed greater urgency in recent years—how to manage risk in the conduct of diplomacy. Three focus articles come at the issue from different points of view. Foreign Service Officer Michael Dodman, who was most recently consul general in Karachi, Pakistan, describes his approach to conducting effective diplomacy in the wake of Benghazi. Former Assistant Secretary of State for Diplomatic Security Anthony C.E. Quainton looks at the need for diplomatic security triage in a dangerous world, and retired FSO James L. Bullock implores the Foreign Service to keep embassy security in perspective. Our cover story this month is a contribution from the Director General of the Foreign Service and Director of Human Resources Arnold Chacón. "Building a Foreign Service for 2025 and Beyond," co-written with Special Adviser Alex Karagiannis, presents plans for harnessing talent for the front lines of diplomacy in an increasingly complex world. In “Tips from the Belly of the Python,” FSO John Fer offers suggestions for those, such as himself, who are part of the large mid-level cohort of Foreign Service members making their way—slowly— through the career and assignments system. In Speaking Out, retired FSO and public diplomacy veteran Joe B. Johnson advocates a strategic approach to public diplomacy. And Jim Owen, whose father served in the Foreign Service for close to 30 years, contributes a poem about his experiences as a Foreign Service child in Cold War-era Moscow in Reflections. In his monthly column, AFSA President Bob Silverman has ideas for how to support career development within the Foreign Service. Last, but by no means least, is a previously unpublished article written in 1982 by FS spouse Patricia Norland. Her husband Donald was a longtime FSO and ambassador, and their three children—Kit, Richard and David—all joined the Foreign Service. Her reflections on being a "trailing spouse" and the hard work involved are a fascinating window on a Foreign Service that in many ways does not exist anymore. From the Director General, a look at plans for harnessing talent for the front lines of diplomacy in an increasingly complex world. Security professionals must balance risks against the requirements of diplomatic engagement. A veteran FSO takes a critical look at risk tolerance—or the lack thereof. How can we optimize our own professional development and strengthen the Foreign Service while negotiating a challenging mid-level passage? Here are some suggestions.